If possible, find out from the manufacturer if the doors are constructed using mortise and tenon joinery or dowels. The first method is preferred as it provides a much stronger door. Other than hinges, cafe or saloon doors have no hardware. There are no locks and there is a large open space beneath the doors. If you want to keep small children out of a room do not install cafe doors. I think that every person who has watched a Western movie knows what a saloon door is. We have seen how easy it was to throw out trouble makers through the swinging doors. Saloon doors bring up memories of frontier towns and cowboys. 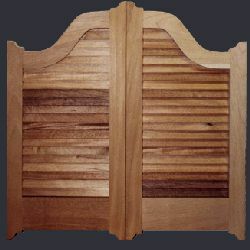 Today saloon doors are better known as cafe doors and sometimes as western doors. For practical reasons they are still used in some commercial places such as restaurants where food carrying personnel can open the swinging doors to the kitchen area from either way. Cafe doors are also found in private homes, especially in the basement bar area. They are also often installed between the kitchen and dining room. Saloon or cafe doors are lightweight and allow easy passage between rooms. Each door has two bidirectional hinges allowing the doors to swing outward as well as inward. After entering or exiting the room the spring loaded hinges will return the doors to a closed position. Other advantages of cafe doors over standard full size hinged doors are that they allow light to pass from room to room, increase ventilation while at the same time provide a bit of privacy. Cafe or saloon doors are sold either as a pair of half-width doors or as a single door. They are either installed in the middle of the doorway opening or start at knee height and up. Cafe or saloon doors are usually 3'-4' (0.91-1.22 m) high with a 1" (25 mm) gap between the two doors.